Furniture for sale ads in Port Macquarie. Thank you for visiting our free advertising website Furniture for sale, Port Macquarie section. We provide high response free classifieds and free advertisement. Use our online free Furniture for sale classifieds placement system to find, list, offer Furniture for sale online! Avoca 3 Seater lounge with RHF chaise. 10 cm arms with vitality seat foam. Material- Baxter (scotch guarded), Colour - Alloy Dimensions - lounge 2.65m Chaise length 1.95m Lounge in excellent condition Location Lake Cathie. Dark brown wood with middle section open for equipment with shelf & two side cupboards with shelf & louvred doors - shelf 465 x 175. Length - 1.45m Height - 50cm Depth - 50cm Excellant condition Would make a great Christmas present..
Near new. EXCELLENT condition No stains Comes plastic covered to ensure protection during transportation. $400ONO. Entertainment unit - attractive, black wood with inset black glass. Four drawers and two shelves suitable for other electronic equipment. L 490 cm W 60 cm H 500, cm In excellent condition. Hall stand glass 1.22 cms long and 40cms wide downsizing need to sell. Black Entertainment Unit H 47cm W 178cm D 45cm, excellent condition..
Two lounges one x 3 seater 1 x 2 seater. They are good quality feather and foam lounges but need recovering. FREE. We will even deliver them if required..
Price $50 This is a ottoman cube that folds out to single bed with zip of suede cover as new condition high density foam as new condition can be use as a seat bed or foot stool. IN very good condition 7 year old two seater lounge and two single chairs. Patterned fabric , no defects at all.Located Crestwood Port Macquarie. QUEEN SIZE BRASS BED HEAD FOR SALE $550.00. 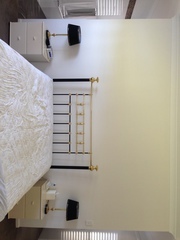 2 single steel framed beds in very good condition with fully sprung mattresses included in price. Total for 2 = $80. Optional 2 mattress protector covers $10. Phone Fran 0431 973 891.. Larger than most 1645 x 800. Good condition. Can dismantle for transport..
Shelving for books, dvd's, ornaments or a mixture. Could also be used as a divider. In very good condition. Can be dismantled for transport. 1490 wide 1200 high 290 deep. Is on lockable wheels. $75 ono..
3 x 3 white leather lounge modular pick up only, used but good condition very comfy. Red two seater couch. Feather back cushions. Has a second set of covers. Good couch selling as we are moving abroad..
Light wood was expensive so really good quality. Extends if needed. Also had glass top made for table.. Lounge Suite - LA-Z-BOY 3 seat lounge plus 2 recliner/rocker chairs - colour slate (grey/blue)good condition - If required can send photos via email, would require email address. Solid Wooden Table 6 Chairs Very good condition Port Macquarie Pick Up Only $550 ONO. Australia free ads for Furniture for sale, Port Macquarie, Furniture for sale free ads Port Macquarie, Furniture for sale for sale Port Macquarie, Furniture for sale to buy in Port Macquarie. Find on this page free classifieds for Furniture for sale in Port Macquarie. This listing includes classifieds for sale and to buy in Port Macquarie. FREEADSAustralia Port Macquarie offers you a platform to post free advertisements or classifieds for Furniture for sale in Port Macquarie. FREEADSAustralia helps you search, find buy, sell, rent or hire in various categories like apartments, goods for sale, local services, cars , jobs and many more in Port Macquarie. If you posted an advertisement in category Furniture for sale of FREEADSAustralia Port Macquarie before please use Edit my ads button to change or cancel your ad. Furniture for sale Port Macquarie ads Port Macquarie, Furniture for sale classifieds Port Macquarie, Furniture for sale free ads Port Macquarie, ads for sale Port Macquarie, ads to buy Port Macquarie, FREEADSAustralia. Find here ads for sale, to buy and rent in Port Macquarie. Goods for sale in Port Macquarie, vehicles for sale in Port Macquarie, Port Macquarie real estate for sale, Port Macquarie property for sale, property for rent in Port Macquarie, business ads in Port Macquarie, Port Macquarie business classifieds, services in Port Macquarie, Port Macquarie services ads, jobs in Port Macquarie, pets for sale in Port Macquarie, Port Macquarie dating, Port Macquarie cars for sale.